Note that this is my first Pandinus imperator, so make sure to read other sources on how to house this species as well. I do have experience with keeping Diplocentrus melici, a Mexican species that requires high relative humidity, though and also did some research before I started on this terrarium. I decided to use 3 layers of substrate to get a total depth of about 14 cm. The Emperor scorpion loves to burrow, and since it's a large species 14 cm is probably close to the minimum required for this species. For the first layer I used about 1 liter of fine sand, mixed with very fine sand, which I mixed with about 3 liters of Jungle Bed, and the chunks of wood, and fine wood powder to create a compact layer (ratio 1:3). For the second layer I used the rest of the sand mix, 1.5 liters, mixed with about 6 liters of Jungle Bed (ratio 1:4). Finally, for the top layer I used only Jungle Bed (2 liters). Not mentioned in the list, but something I added as well was substrate from my Zophobas morio ("superworms") breeding box. 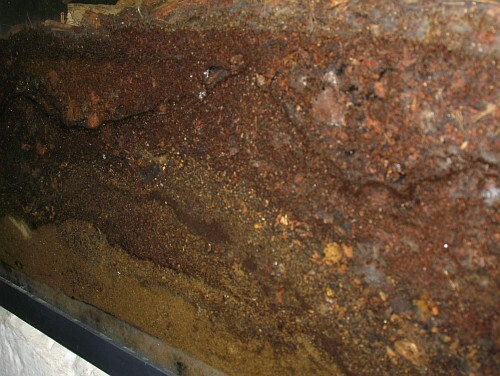 This substrate has been processed by larvae several times, and is very fine, and has a very dark brown color. I added about a cup to the second layer, and about half a cup to the top layer. 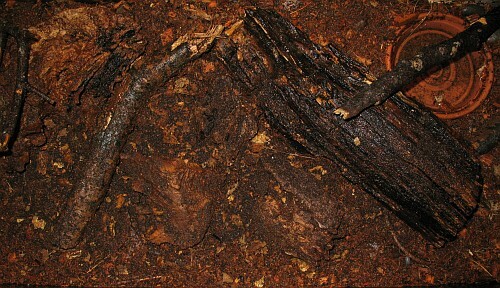 Emperor scorpion terrarium, top view. For decoration I used a few pieces of rotten tree limb - soft wood, with holes in them, some of the smaller ones made by Zophobas morio larvae ("superworms"). I pushed the pieces of wood firmly into the substrate. 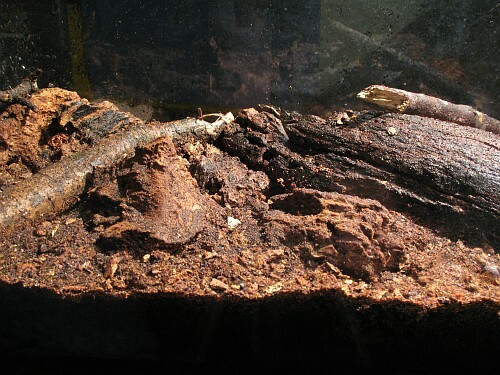 The water dish was added in a corner of the terrarium, behind the largest piece of wood. I also added some small branches and some pieces of dry leaves. Emperor scorpion terrarium, side view. Note: some articles I've read recommend to prevent the scorpion from burrowing under the water dish because it might hurt itself or get stuck if the burrow collapses. 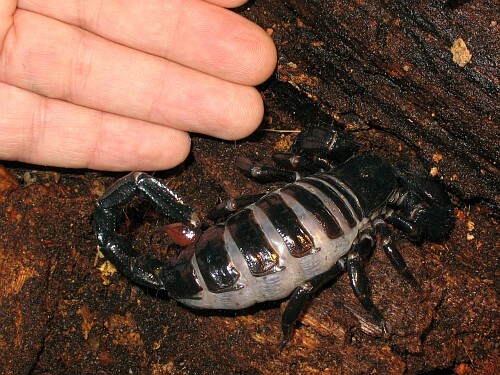 I can not imagine that a plastic water dish, even filled with water, can hurt an adult Emperor scorpion. Still, I think it's good advice for another reason: a tilted water dish can not hold much water if at all, and putting it back into place might collaps the burrow. So in the near future I will make this change to the scorpion's enclosure. The adult female Pandinus imperator in its terrarium, next to my hand. With the substrate and pieces of wood in place I poured carefully about 6 liters of water on the substrate. If you are able to prepare the terrarium before you purchase the Emperor scorpion, I recommend to soak the substrate though. But the pouring method worked quite well. I used a spray can with about 1 liter of water to clean the substrate of the glass, and add additional moisture. Finally, I carefully added the scorpion to its new housing. The scorpion was sold to us in a little carton box which I had cut open very careful with a knife. After the scorpion had moved away from the largest piece of wood, a small log, I lifted the log, and used a spoon to make a beginning of a burrow. Pandinus imperator, adult gravid female in its terrarium. 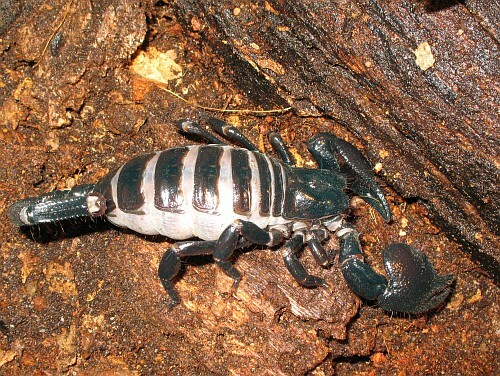 In the above photo you can see the Emperor scorpion. I had bought this scorpion because I was quite sure it was an adult gravid female. At the time of writing, the 3rd of April, I am 100% sure about both because she's hiding in a burrow with scorplings on her back. In the near future I want to add a piece of glass with a 25 mm hole drilled in the center as a cover to the enclosure. I use this kind of cover with both the Diplocentrus melici species I keep as well as with a Uropygid species. The total depth of the substrate is 14 cm (about 5.5 inch).